The incidences of youth violence that have been in the news recently have caused everyone from politicians to sociologists to wonder what is behind the phenomenon. The book Stop Teaching Our Kids to Kill takes a look at some factors which may be behind the increase in violent tendencies in young people. The authors of the book have backgrounds in researching human aggression and parental coaching. The introduction to the book rightly points out the odd fact that many schools have invested in security officers, metal detectors and lock-down drills instead of investigating the root causes of school violence. The main cause of the violence, according to the authors, is the desensitization to and normalization of violence since young people are exposed to it nearly non-stop in films, video games and on TV. 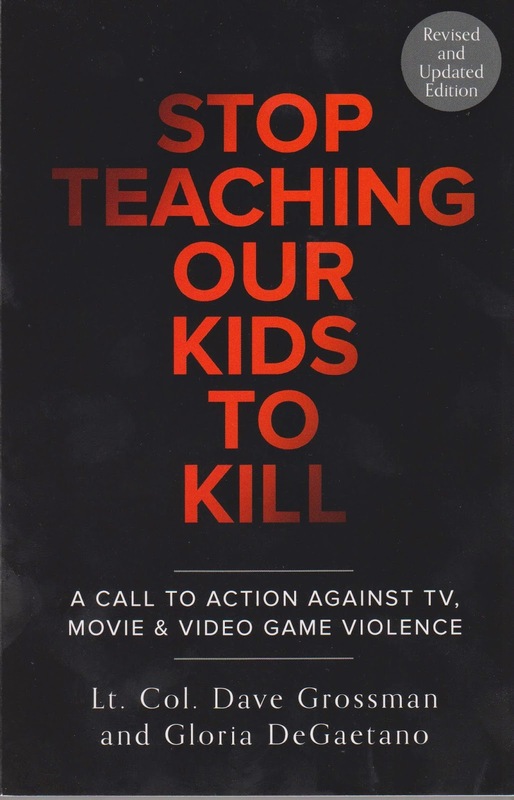 Video games aside, the statistics show that graphic violence occurs in 90% of films and over half of the TV shows children watch. The debate about televised violence has been a factor of American life since the 1950s. Efforts to address the problem throughout the decades have not had much effect. Studies are quoted that show the effects on children who have been exposed to both graphic TV and video game violence. Interestingly, there is a similarity in the training the military does to overcome the reluctance of soldiers to kill another human being, and the techniques that are used in violent video games. Intentionally or not, game players can be desensitized to killing. Of course, not all gamers become killers, but the authors outline "risk factors" that, when combined with violent games, can contribute to people acting out aggression. One interesting chapter shows how young people at various ages identify with violence and shape their own self-images on witnessing violent acts. For parents of children, there is a chapter on how to talk to your child about violence and actions parents, schools and communities can take to intervene in the lives of kids and to counteract the violence children are exposed to daily. The book contains many resources at the back, including ways to talk to children of various ages about media violence, a chronology of studies/investigations of violence, and organizations that are active in the area. I found this book to be an extremely detailed and interesting look at the subject of violence in the media and its effects on children. Naturally, some of the most shocking and horrific crimes committed by youngsters over the past few decades were included as examples, and while those cases are horrible, the truth is that the vast majority of young people are (thankfully) still not acting on their violent impulses. With the rise of violent images children are exposed to, the strategies outlined in the book are useful tools in helping parents and educators counteract some of that negativity. Disclaimer: I received a copy of Stop Teaching Our Kids to Kill from Blogging for Books in exchange for this review.